Neon Signs � Neon Lights � Neon Clocks - Neon Sculptures for Less! We are the leading supplier of affordable neon signs & neon lights for home and business. 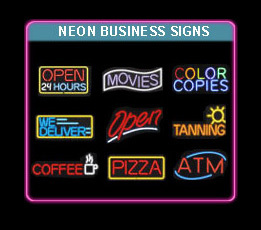 We offer a broad selection of quality neon signs, neon lights, neon bar signs, neon beer signs, college neon signs, sports neon signs, neon business signs including ATM and Open neon signs, neon sculptures, neon posters, neon clocks, neon car body kit lights, and custom neon signs. Our entire product line is licensed including our large selection of Corona neon signs, Budweiser neon signs, Miller Lite neon signs, and Bud Light neon signs. 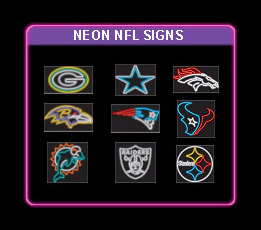 Please consider iloveneon.com your best source for neon signs and neon lights at wholesale prices. 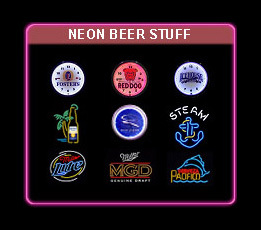 Our neon beer and bar lights are of the highest quality and the brightest neon lights available. HIGH QUALITY NEON AT THE LOWEST PRICE GUARANTEED! The word neon originates from the Greek term "neos," meaning "the new gas." In 1902 the French inventor Georges Claude was the first to apply an electrical discharge to a sealed tube of neon gas to create a light. After displaying the first neon light at an auto convention in Paris in 1910, Georges Claude and his French company Claude Neon, introduced neon signs to the United States in 1923, by selling two to a Packard car dealership in Los Angeles. It attracted so much attention, that the benefits for outdoor advertising signage were undeniable. Visible even in daylight, people would stop and stare at the first neon signs dubbed "liquid fire." Neon lights took off in 1933 with the repeal of prohibition, which created a need for eye-catching advertising signs above bars. In the 30's and 40's, neon became synonymous with Art Deco and dominated the American urban landscape. By the 50's, neon lights had become inextricably linked with drive-ins, diners, and the glamour of Las Vegas. Nothing catches the eye like neon, and it has been the most effective medium for signs all over the world ever since. A neon sign is a very simple device. It consists of a vacuum-tight glass tube that has been bent to resemble either a letter or graphic design fitted at each end with an electrode. Inside the tube is a small amount of rare gas. Connected to the two electrodes is a source of high-voltage electrical power. When the current is turned on, the tube glows with a steady piercing light. Even though neon lights operate at a higher voltage, the transformer does all the work, thus keeping your electrical cost low. The rare gases, neon, argon, helium, xenon and krypton, are ideally suited for use in neon signs. The two most common gases used in neon signs are neon and argon. While neon is very bright, argon's light is weak due to its low resistance. Neon gas gives off a red glow. Almost everything else is filled with argon gas. When you see yellow, blue, green, white or any of several other shades, these tubes are filled with argon gas. The tube may be clear, colored or phosphor coated. Various combinations of gas, glass and phosphor produce over 200 neon colors. The diameter of the tubing and the kind of transformer used to power the neon lights also create subtle variations in hue and intensity. Many neon tubes are coated on the inside with fluorescent powders that filter out different colors from the light spectrum. In combination with the different gasses, an even greater number of neon colors are achieved. For instance, a green tube, filled with argon/mercury (blue gas) will light up green. Fill the same tube with neon (red gas) and it lights up orange. Likewise a blue tube, filled with blue gas will light up blue, and the same blue tube filled with red gas will light up pink. Unlike an incandescent bulb, which has a filament that can burn out, neon lights have no filament, and have a typical life span of 7 to 10 years, and some neon lights have been known to last over 20 years. Neon is the brightest, most versatile, cost-effective, and eye-catching way to write in light. Neon Sculptures | Neon Clocks | Neon Posters | Neon Signs | Neon Car | More Neon!